Accurate Step is the Wave of Athletic Precision where athletes will not only use their bodies, but their minds to excel. Encompassing the total package of what every athlete has to offer. SCRANTON, Pa. - June 16, 2017 - PRLog -- Every journey starts with one step. But, the difference between failing and succeeding is to make that first step is accurate! CEO, Donnie Jackson-Bey has finally gone public with his brand, Accurate Step. From what the previewers are saying.. it's definitely a game changer in the world of sports. Their target market are track and field athletes that will soon expand into football and cross training athletes as well. "We are bringing track and field into the 21st century," says Jackson-Bey. "Track and Field is one of the earliest sports known to man and the competition has become tight that we want to see our American athletes get the competitive edge at every angle that they can get. Our first and most viable product will be our tape markers. What separates us from all others is that our tape will be customized to the athlete's liking. For instance. There could be 30 long jump competitors. But, if they all have the same color tape with just some marker on on the ground. It could be very hard to identify which one is which and could make for a very rushed performance and unsavory results. 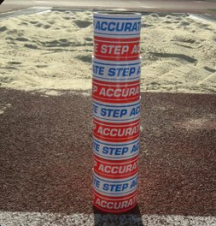 This innovative concept of marking will be applied to hurdlers, all field athletes, and relay racers. We plan on moving into cross training athletes, football players training for combines, and even baseball players in the off season. We have a reliable product for not only identification, but also for inclement weather. We believe accuracy and precision is key to separating top talent and we want to play a vital part in that arena." On May 30, 2017 the company has recently partnered with Aluminium Athletic Equipment (A.A.E.) who is a big player in the track and field industry; more notably the Penn Relays. Accurate Step is currently working with SEC and Big Ten schools along with high school athletic programs in the Midwest, West Coast, and Southeastern United States. The contractual details are being worked out as we speak and things are looking very positive for this new and innovative company. "The website is being developed and is always evolving as the digital world continues to move forward." Accurate Step will be hitting the pavement running this coming school year. Their intent is to hit as many athletic expos, track and field championships, and sports festivals as possible. As of yesterday the CEO stated that he will be at the Arnold Sports Classic in Columbus, OH the first weekend of March 2018.